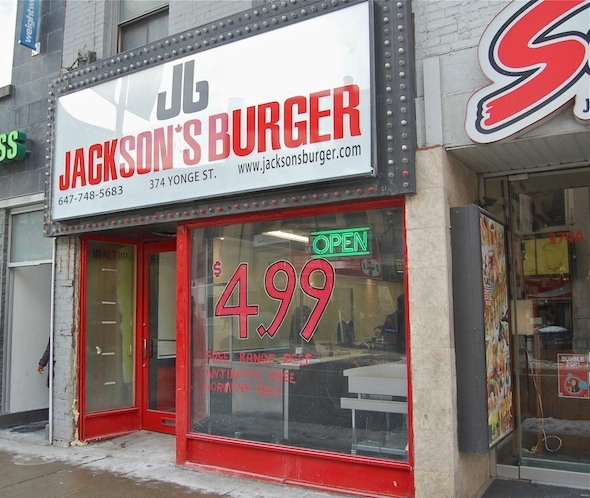 Jackson's Burger at Yonge and Gerrard throws its hat in the Toronto burger war ring with its hormone and antibiotic free beef and Ryerson-happy location, but how does it do? With meat raised at Paradise Farm in Caledonia, the results speak for themselves. It's a choose your own toppings kind of place, with an appropriately wide array ranging from your standard favourites (tomatoes, lettuce, pickles, etc.) to the more highbrow (green apple, caramelized onion, eggplant - add $0.99). A wide array of cheeses ($0.99), such as cheddar, brie, and goat hint at the gourmet aims here. The burgers themselves are juicy, neither burnt nor crisped, with the strong clean flavour of beef taking centre stage. In general, the patties here are above average and well priced at $4.99. 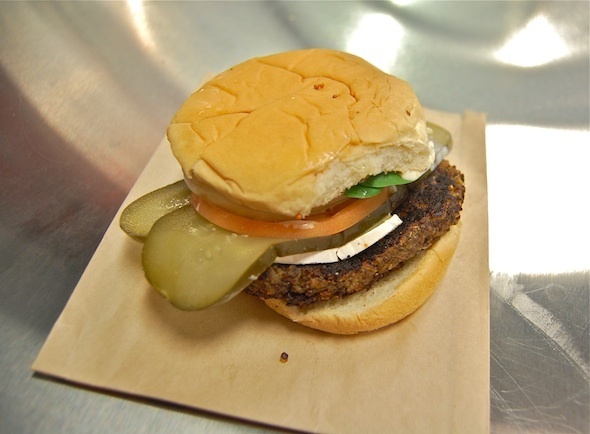 Lamb burgers ($7.99), made from Ontario raised lamb, are if anything even better. Juicy and flavourful may be a redundant way to describe them, but it's true nonetheless. 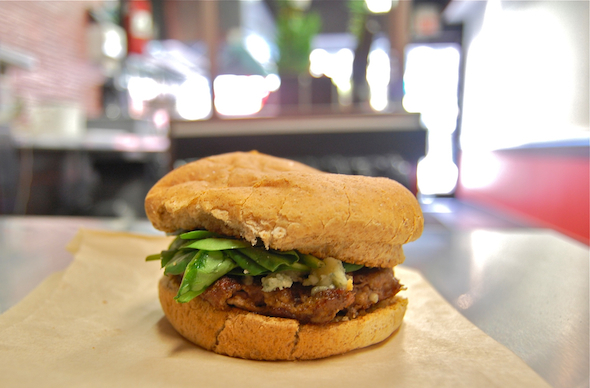 A pairing with spinach and blue cheese results in a complex but delicious burger. A welcome surprise, given Jackson's commitment to high quality meats, is the veggie burger ($4.99). Made from red quinoa, chickpeas, herbs and lemon, it's an instant contender for "top" lists. It's almost rosti-like, again simply cooked to allow the taste of the grains to predominate. It's also vegan-friendly and can be combined with a gluten-free bun (or white and whole wheat). There are, however, some structural issues - literally. For whatever reason, the patty quickly mushrooms outside of the bun, making eating on the go a bit of a challenge, albeit one worth attempting. French Fries ($2.99/$3.99) are blanched before being fried in oil, an approach Chef Naffa boasts cuts down on the grease factor. The result is indeed a lighter and more flavourful potato, albeit one lacking somewhat in crispiness. 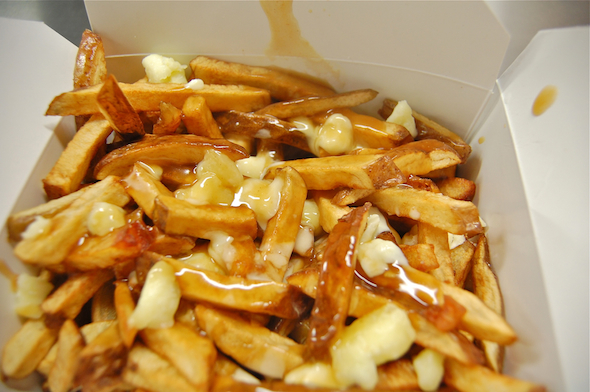 They do combine for a rather decent poutine ($4.99) with a light, aromatic gravy that doesn't overpower and an abundance of cheese curds. 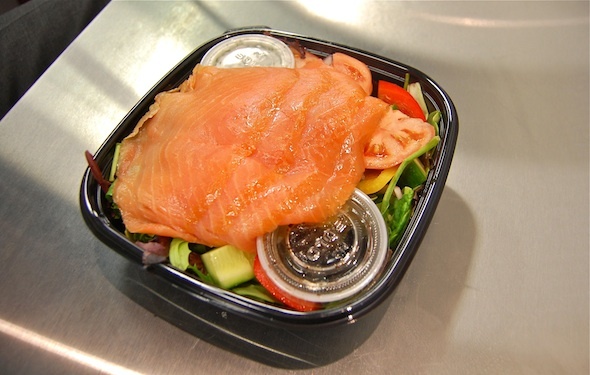 The Jackson Salad ($7.99) continues with the light and healthy motif, pairing smoked salmon with a fresh mixed greens and cucumbers, red onion, capers, tomato and red and yellow peppers, accompanied by both a vinaigrette and a creamy dill dressing. Jackson's Burger has only been open since a soft launch on New Year's, and is still working out a couple of things - at the time of our visit they were still waiting on their menu board, for example. 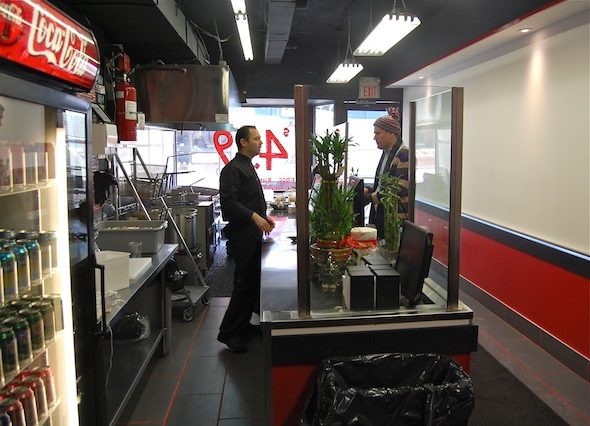 Takeout may be the preferred option in any case, as the space itself is small and not especially inviting, although again this could change. Photographs by Miranda Whist. Follow Anders on Twitter .